"This hearty, power salad bowl is loaded with quinoa, beans, and egg for a vegetarian meal with great sources of protein." 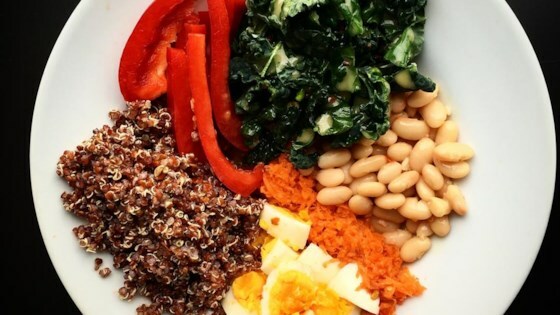 Arrange kale, quinoa, garbanzo beans, red bell pepper, carrot, and egg in a bowl. Whisk lemon juice, olive oil, parsley, mustard, maple syrup, salt, and pepper together in a small bowl until dressing is well mixed. Pour dressing over salad. So good! I am not a fan of quinoa, but thought I’d give it another try. The quinoa takes on the taste of the dressing - which is delicious! I doubled the dressing. This recipe is delicious , easy to make, and very filling. My son and I made it today for lunch. The only change I made is I substituted baby spinach for the kale because I don't like kale.